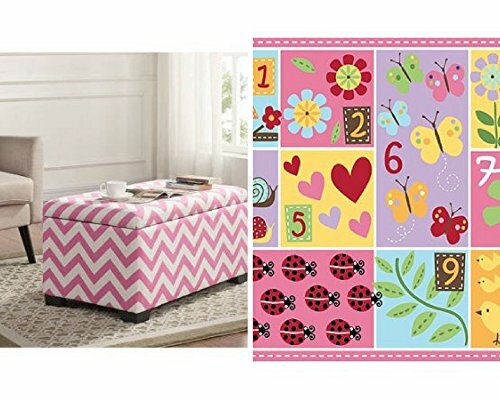 The Better Homes and Gardens Kids Storage Box offers a festive combination of fashion and function. This spacious item is cushioned so it also serves as a bench. Place it at the foot of a child's bed to hold sports equipment, books, toys and more. Introduce this piece to your living space as a decorative option to traditional organizers. The Mainstays Kids' Teach Me Numbers Rug is an educational tool to help your children learn their numbers with a fun and colorful area rug. Each square of this multicolor kids' rug uses different critters, flowers or shapes to help your child identify each number. The nylon kids' area rug has a large (40" x 50") playing area for your child to enjoy. See how much fun learning can be with the Mainstays Kids' Teach Me Numbers Rug.